Strange coincidences, or not-so-hidden connections between violent shootings and Hollywood film? 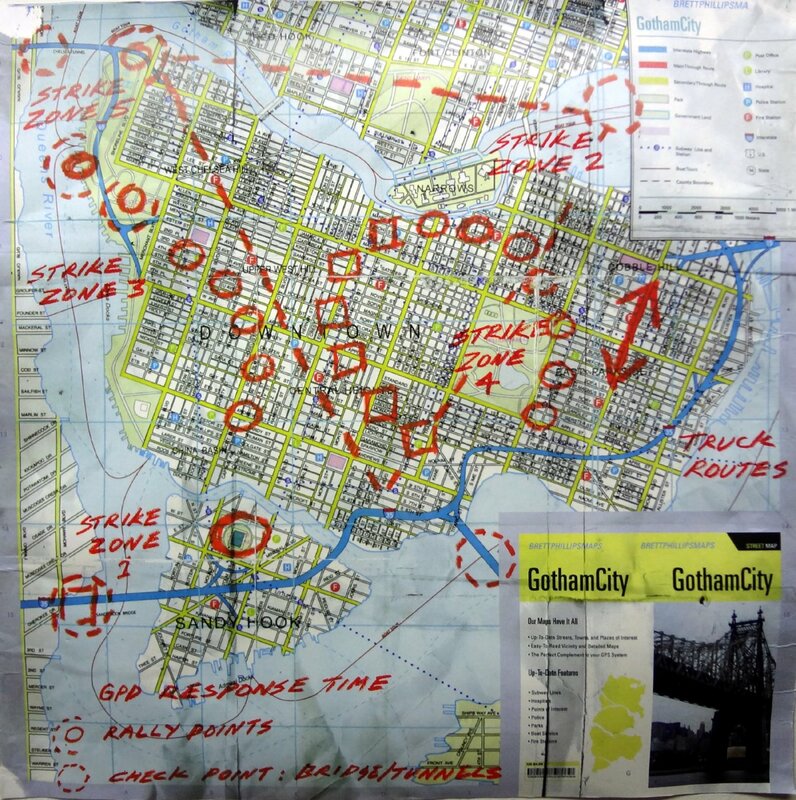 Gotham map showing ’Sandy Hook’ bottom left, from BatmanGothamCity.net. For large image, go here. There are rather eerie coincidences as new details emerge about the tragic mass shooting at the Sandy Hook Elementary School in Connecticut. It turns out that Adam Lanza’s mother, Nancy, was a so-called prepper who believed the world economy would collapse and she would need guns and stock-piled food to defend her home and for long-time survival. According to new reports, Ms. Lanza, described as overly-protective of her emotionally disturbed son, purchased the high-powered guns which were used by her son to carry out the mass shootings, and she taught both of her sons how to shoot them. The hit movie “The Hunger Games” takes place in a dystopian future where the poor and wretched masses live under the high tech tyranny of a wealthy elite. Is the movie depicting the kind of society the elite is trying to establish for the New World Order? We’ll look at characteristics of the world presented in “The Hunger Games” and how they relate to plans for a New World Order. Set in a dystopian future (why is the future always “dystopian”? ), The Hunger Games paints a rather grim picture of the world of tomorrow, whether it be from a social, economical or political point of view. In short, it is a big-brotherish nightmare where a rich elite thrives on the backs of a starving population. Meanwhile, the perversity and voyeurism of mass media is taken to absurd levels and is used by the government as a glue to keep its unjust social order intact. Is The Hunger Games giving teenagers a glimpse of a not-too-distant future? It doesn’t take a crystal ball to see the elite are trying to take the world in that direction. Is the author Suzanne Collins communicating a strong anti-NWO message to the youth by showing its dangers or is it getting the youth used to the idea? Scene from The Hunger Games where ’Rue’, a young child, is killed during the sacrificial survival games.